Tired of tripping over guitars, Brad Evans created this rack using oak wine barrel staves. Fine wine and a strumming guitar—Brad Evans' rack combines these classic counterparts in a design that cradles your beloved six string. Tired of his guitars being daily tripping hazards, Brad created this rack as both a display system and an organization tool. The mount is made from reclaimed oak barrel staves (the curved planks that make up the barrel's sides) used in Napa Valley wine production, each with its own one-of-a-kind patina and endearing imperfections. 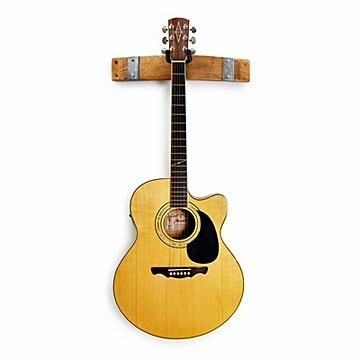 The padded hooks are easily adjustable to hold any guitar safely and securely. Choose a single or double rack—either will strike just the right chord with your decor. Handmade in Lakewood, Colorado. An avid musician with a BA in vocal performance, Brad Evans built a guitar as a kid, inspiring a lifelong fascination with woodworking. When his tastes turned to wine, he was enthralled with the tradition of barrel making and sought to revamp used barrels into functional works of art. Over the last decade, he has developed a premier line of furniture and decor. I love the deep wine stain on one side of the reclaimed wine barrel wood. We haven't hung it up yet, but have taken it out of the box to see it. We bought it to use in a house we are building. Husband loved the design, however the picture is much better than actual. Cheap dinged wood. Would not hold guitars securely. my nephew plays the guitar and wanted to hang it on the wall. He has a barrel as a night stand and it matches perfectly. The picture on the website is a duplicate of what we received.